Andrea Shalal, “Germany launches charm offensive to redefine U.S. ties” , Reuters, October 2, 2018. The Immigrant Cookbook. Interlink Books, December 2017. “From the Archives: The Pretzel Proposition”. Monument Lab (Archives Month Philly), October 2, 2017. Michael Rosen & Annemarie Young. Who are Refugees and Migrants? What Makes People Leave their Homes? And Other Big Questions. Hachette Children’s Group, September 2016. Podcast with Phoebe’s Pure Food, October 24, 2016. Interview with 196 flavors, November 18, 2015. See also my contribution to the 196 flavors ebook with Christmas recipes from around the world (available for free download in English and French). “What Eating Seasonally Means to the Rest of the World”. Rodale’s Organic Life, October 8, 2015. PCN Profiles. Interview on PCN TV, July 10, 2015. Jennifer Hetrick. “Canning Benefits“. 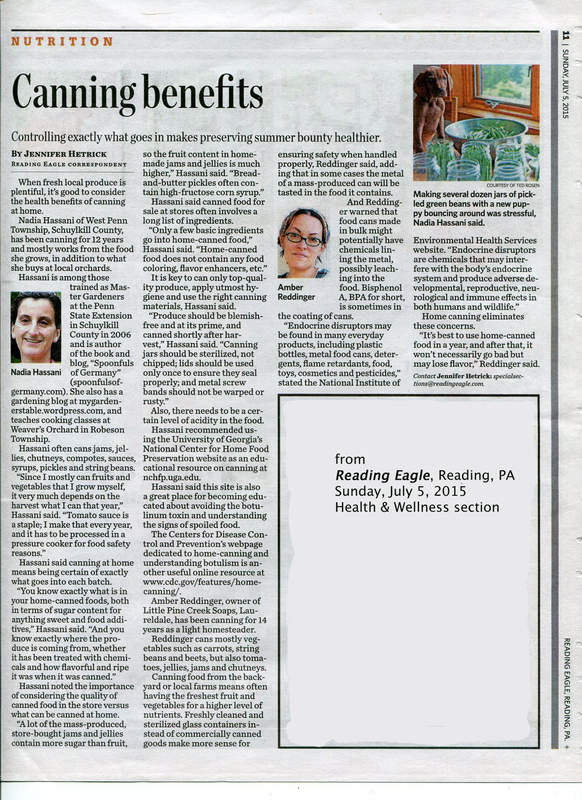 Reading Eagle, July 5, 2015. Spoonfuls of Germany – Book Review. A German Girl in America, March 22, 2015. Pike Dumplings in Broth. Hunter Angler Gardener Cook, March 5, 2015. Nadia and Ted on “Heartbeats”. Deutschland.de blog, February 2015. “La véritable histoire de Hansel et Gretel”. French translation of my blog post on the website of the German Embassy in Paris, December 12, 2014. “Pâtisserie allemande de Noël : le Bremer Klaben”. French translation of my blog post on the website of the German Embassy in Paris, December 5, 2014. “European Pear Recipes”. Cooking demonstration (video) at Weaver’s Orchard, September 14, 2014. “Forgo the Frankfurter – The Best Recipes in Germany”. Emerald Waterways News, August 29, 2014. Anja Baumgart Pietsch. “German Cuisine in Pennsylvania.” Wiesbaden Times, April 11, 2014. Reblogs from Spoonfuls of Germany on the blog of Young Germany since March 2014. Anja Baumgart-Pietsch. “Woihinkelsche aus Pennsylvania”. Wiesbadener Kurier, January 21, 2014. Jennifer Hetrick. 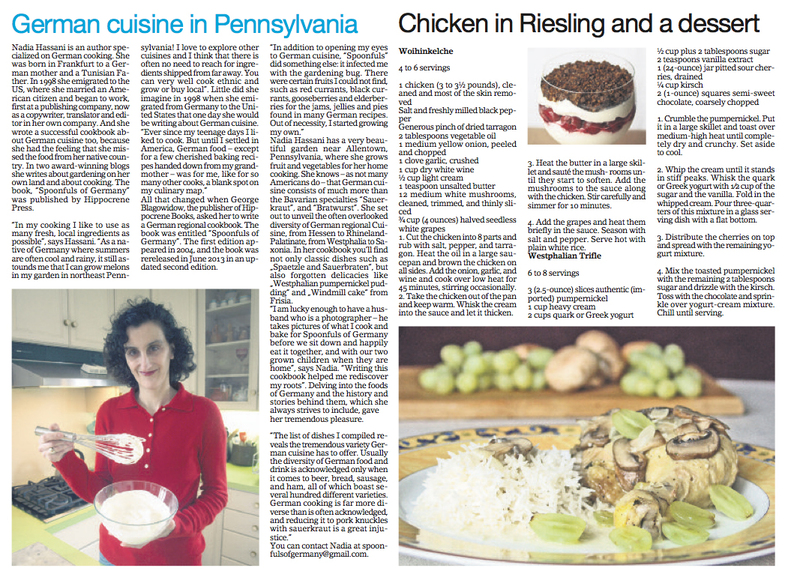 “German Cookbook Provides a Taste of Home.” Reading Eagle, January 15, 2014. Ten of Germany’s Best English Blogs. The Local, January 8, 2014. Dianne Stoneback. “Regional Cuisines of Germany”. The Morning Call, November 27, 2013. Stephen Fuchs. “‘Spoonfuls of Germany’ Cookbook Offers Up A Regional Taste of Germany”. German Pulse, September 17, 2013. Interview on Rick Stein’s German Bite program on BBC2, August 5, 2013. Shannon Oelrich. “Beyond the Schnitzel”. Edible Austin, Fall 2010. Peter Peter. Kulturgeschichte der deutschen Küche, p. 234, 236. C.H.Beck Verlag, 2008. Faye Levy. “Squashes – Sweet, Sour and Savory”. Jerusalem Post, December 1, 2005. Peter Peter. “Deutschland zum Löffeln.” Frankfurter Allgemeine Sonntagszeitung, July 30, 2005. For recipes featured in print and online media, please go to my Recipes page. Recipes from the book Spoonfuls of Germany are also featured on the website of the German National Tourist Board.